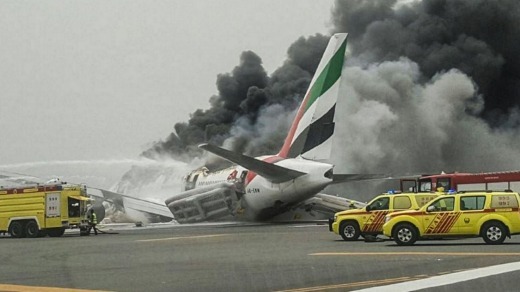 Earlier this month, we learned that an Emirates flight from India had an emergency requiring passengers to quickly evacuate their burning plane at the Dubai airport. 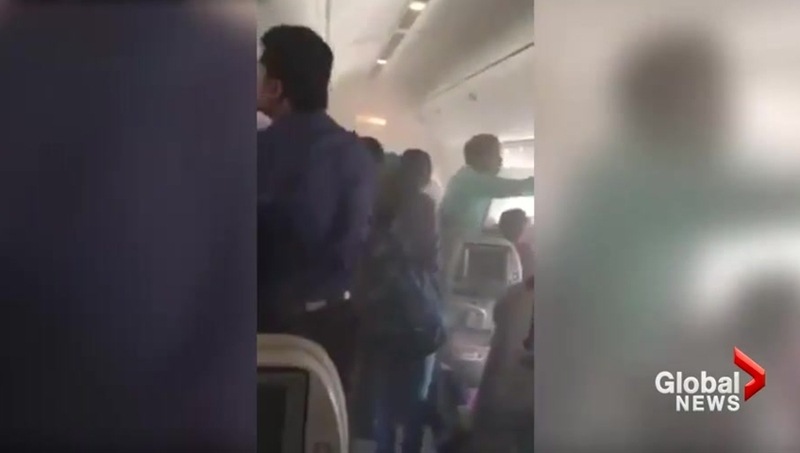 All 300 people made it off the plane without serious injury, but as you can see in the video below, not before many passengers spent precious time grabbing their personal belongings from overhead bins. One firefighter died while battling the blaze, and while it is not clear exactly how that happened, it does make me wonder, if the plane had been cleared sooner, would the fire have been smaller and easier to control by the time firefighters could move in? Every safety video I have watched, every piece of advice I have heard from airline employees, every news piece on air travel emergencies such as this, has driven home the message that in case of emergency, passengers must drop everything and focus on remaining calm, listening to instructions, and exiting the aircraft as soon as possible. If you have ever tried to board a bus at the ferry terminal, you know that people with luggage take longer to get on, move down the aisle, and get settled, than people without luggage. I know I’ve waited up to 10 minutes to get on behind these people, and I certainly don’t want to spend that much time breathing smoke in a burning aircraft waiting behind my fellow passengers while they struggle to get their extra sweater and travel pillow down from the overhead compartments. I also don’t want to be stuck on the plane because the people ahead of me cared more for their carry-ons than my life, and punctured the slide with their belongings so it deflated before I could evacuate. So, this led me to ask why people attempt to take their personal hand luggage with them when they evacuate. Why would people do that?!?!? The internet is full of speculation on this topic. The passenger who filmed the Emirates evacuation thought it was because they were selfish. This idea fits well with a “me first”/”rules only apply to other people” mentality. Others have pointed to a lack of air travel experience amongst the passengers or bizarre panic reactions. An Indian expat chalks it up to the mindset of people who value greatly what little they have, in lieu of basic rights as expat workers in the UAE. However, this dangerous mindset isn’t limited to foreign workers. Bag grabbing has occurred on all sorts of airlines in all sorts of regions. One study found that almost 50% of passengers try to bring their luggage when they evacuate. The main reasons passengers gave for grabbing their bags was money, wallets, or credit cards, followed by work materials, keys. and medication. If you take away the other emotional reasons and look at the logistical fear of being separated from your belongings, you’ll see that for a lot of people, it boils down to not knowing what you will do without the basics of modern life, like money, ID, phones/computers, and medications. I did a google search and couldn’t find much on this topic. So, I posed a few questions to some airlines, airports, emergency social service organisations, transportation and border authorities. I quickly found out that there is absolutely no excuse for wasting time trying to bring your belongings in an emergency evacuation. Jane Doe is an Australian passenger flying from Honolulu to Toronto via Vancouver. Her plane has an emergency requiring evacuation by slide at YVR. She is required to leave everything behind, including her shoes, medications, and prescription glasses. She would like to continue her trip to Toronto, but now has no money, credit cards, or ID. She can’t read the signs at the airport without her glasses, and needs to take her medication with food within the next hour. She also has a minor cut on her foot from something she stepped on as she was evacuating. Lauren, from Westjet, told me that they have a Special Assistance Team (SAT) that delivers humanitarian assistance in times of emergency. These corporate volunteers receive specific training to enable them to provide compassionate, emotional and physical support to survivors and families directly affected by an emergency. She gave the example of a recent non-specific threat that forced the landing of a WestJet flight from Vancouver to Ottawa to land in Thunder Bay. Guests and crew were offloaded by RCMP, provincial police and local police. SAT Guests were temporarily sheltered in buses while the initial investigation took place. While on the bus, the SAT arranged for pizza, water and cell phones so that guests could make contact with loved ones waiting at home. Later, all guests were accommodated in a nearby hotel until they could board their flight the next day. Reports on the EK521 passengers indicate that they were not left to fend for themselves either, but were at the very least offered hotel vouchers before their onward travel. While passengers would mainly be the responsibility of the airline involved, James Bogusz, of the Victoria Airport Authority, contributes, “In my experience, when an irregular situation like this comes up, you will find that typically everyone involved will make best efforts to accommodate those impacted. Airlines and airports have emergency response plans that handle a variety of issues”. He also points out that they have protocols to call in mutual aid from fire/police/ambulance in the case of larger emergencies, and those agencies may call in emergency social service (ESS) agencies in the community if they are deemed necessary. In some communities, ESS is provided by the Red Cross. Andrew, from the BC/Yukon branch confirmed that in the event they were called in, they would make sure that “people didn’t fall through the cracks” and would receive the assistance they needed. They also pointed out that individuals could contact their consulates or embassies for emergency travel documents. So, if our Jane Doe needed to go to the hospital to get her foot patched up, CBSA would not stand in the way of her getting proper medical treatment. Returning to the Emirates emergency, the embassies, airport, and other local authorities assisted passengers in replacing their lost travel and identification documents. So, your basic needs of food, shelter, and medical care will most likely be taken care of by the airline in conjunction with the airport and local emergency services. Your travel documents will be replaced. What about your luggage? Westjet confirms that they would hold or send your luggage on to you, if and when it is possible to retrieve it. Each airline outlines their responsibilities for lost or damaged luggage in their tariff. You can usually find this information on the airline’s website. In the case of EK521 passengers, Emirates went above their legal obligation in offering $2000 for loss of luggage, and an additional $5000 to cover any other damages. They were also refunded their original ticket purchase. In the event of an emergency evacuation, there is no valid reason to slow down the process and endanger your life and those of your fellow passengers, crew and emergency services by attempting to bring your personal belongings with you off the plane. You will be taken care of and assisted to get where you are going. You may even be compensated for your losses, or have your belongings returned to you. I recommend not travelling with irreplaceable possessions, backing up your phone and laptop frequently, taking out adequate insurance for your needs, and keeping your most important things on your person (in your pocket) while you fly. Most importantly, I recommend remembering that your life (and mine) is more important than your carry-on. Replacing a passport may be a major hassle, but it is not a fate worse than death. Thanks! I talked to a lot of different sources for this one. I think the key takeaway here, is that this can and does happen many places, in a variety of cultures. There are a few examples of it in the US here http://onemileatatime.boardingarea.com/2015/09/10/leave-carryon-items-behind/ The important thing is to know, yourself, what to do. Set the example and discourage others. Fantastic write up! Really good information. In the case of the fire emergency, I wonder if it was a case of watching other people do it first, and assuming that was the acceptable behaviour for the current situation. Either way, I hope if I was ever faced with an emergency flight situation that I would just evacuate and worry about the material stuff later. Thanks again for the information!! That’s a good question. I guess it’s now up to everyone who reads this to set the right example and leave the luggage. I love how informative and educational this post is! Thanks for going the extra mile! Thanks Kristine! I think knowledge is the best preventative. Great read, I have shared and hope every traveller stops and thinks about this if they are ever faced with an evacuation. I know I’ve seen the drill every time I fly telling me to leave my things, but in a panic, faced with loss of ID, medication, etc I hope I will remember this too. I can’t believe people would do that! Well done on sharing this. People do strange things when under stress. But I think that a little knowledge can go a long way. Lack of travel experience is probably a huge factor as are many annoyances you see on a plane. I’ve been traveling so much now that I have everything I *need* in the seat pocket in front of me in a pouch. I would NEVER go into the overhead bin and honestly would be appauled with such behavior. If I had to evacuate I would try to take my pouch with everything (meds, ID, money, phone, etc) I need since it would literally take 1 second to grab as I got out of my seat. If I couldn’t do that, my passport would go in my pocket…but remember, it’s already at my fingertips. But entire suitcases, that’s just silly. Personally, I’m conflicted. I would be tempted to grab a small pouch containing those items as well but in my research I read about situations where the straps would catch on seats and slow people down, and other items could puncture the slide, and also evacuating passengers may need both hands to keep themselves upright on the slide. Thanks for this thoroughly researched piece it does shed light on an issue that is seldom mentioned or even thought about. Thank you. You’re exactly right. There are always solutions, if you’re alive. It is hard to understand why passengers would endanger their own lives and the lives of others by reaching for possessions during an emergency evacuation. On the other hand, I never want to find myself in a foreign country without a passport and credit cards. At least you know you would be taken care of. That’s what embassies and consulates are for. Your post has made me think about what I would do. I have not been in such an emergency but I can’t fathom staying in an aircraft a minute longer when you have been told to evacuate. Good to know that authorities are very understanding of these situations and that your needs will be taken care of to the extent possible. I remember seeing that video a few weeks ago and thinking “well there’s proof that everything I tell my passengers as a flight attendant goes in one ear and out the other.” It is hard to believe that people evacuating a burning aircraft would reach for their belongings and, thus, delay saving their own lives in the process. Then again, a lot of people probably would feel stranded without at least their valuables and don’t realize that they will probably be compensated for their losses by the airline. What a scary situation. You’ve provided great information. I hadn’t realized that the airline would take care of all of your needs the way they do. That is amazing, especially for people who have to leave medications behind that they need to live. No one should be trying to take personal belongings with them in an emergency. I’m a very nervous flier to begin with so this was scary to read but reassuring. I think it’s also important to consider that in this situation, you’re in a panic. You don’t think straight. Maybe your first thought goes to your daughter, and you have a picture of her in your bag or something, I don’t know. I bet that’s what’s happening. When you’re faced with a life or death situation, you don’t think, you just do. I hope to never be in that situation…how scary. I imagine when a plane crashes or makes an emergency landing, people aren’t thinking clearly and just acting on adrenaline and instinct and their instinct isn’t to leave anything behind, but my instinct would be “get off a plane that might blow up”! I guess until you’re in the situation you never know what you would do. Let’s hope we never have to find out first hand! Thanks for the info though – you can never be too prepared! Well researched and a good read. It’s always hard to know what I’d do in that situation until it happens (which I hope it doesn’t). Tough to know what would happen in reality…actually don’t want to know 🙂 Though I appreciate you bringing this very real possibility up for discussion. Agree, a few minor possessions do not compare to the loss of lives. Everyone would need to keep off the flight and quickly! Well done! What a useful and insightful post! This is a topic that most of us do not want to think about and I believe this is in part why some folks try to take their stuff with them in emergency situations. I think some just don’t think that this sort of thing may happen and so when it does, we are in denial in part and also want to feel in control of something, right? I am not at all excusing the behavior! Just trying to understand it as well. I think you did a really fantastic job with asking officials and make a case for leaving your stuff behind! It’s just stuff after all! Thanks! I think you’re right about wanting to have some small aspect of the situation that you can control. Omg, what an insane article! I’m shocked, yet at the same time, not so shocked that people will stop for their carry on bag before evacuating. I think it’s just a first reaction kind of thing. When you are in a state of emergency like that, it’s almost like your body is just on auto pilot and your not quite sure what you’re doing. Anyways, great article. Thanks for sharing!